Dock Boxes Unlimited®: The Ultimate Source for Fiberglass Dock Boxes Nationwide. Nothing affects the look of your docks and marina more than the dock boxes you select. When you choose fiberglass dock boxes, you maximize the overall style and appearance of your dock and marina. That’s why standardizing your dock boxes makes so much sense. You want someone with exceptional customer service and who understands the importance of your investment. Standard dock boxes come in a variety of shapes and sizes to fit every need. Constructed of fiberglass with reinforced lids for seating (includes pneumatic lid lifts), stainless steel continuous piano hinges for strength and lockable hasps for security. Standard dock boxes are rectangular in shape. They allow for storing your standard boating gear and equipment such as life jackets, fishing gear, cleaning products, rope, etc. ALL FIBERGLASS DOCK BOXES in our Standard Dock Box range are made with reinforced lids for seating, stainless steel continuous piano hinges for strength and stainless lockable hasps for safety. Low profile dock boxes are typically low and narrow which make them ideal dock boxes for narrow docks and walkways. Although all of our dock box models have reinforced lids for seating, the Seat‐top dock boxes provide comfortable seating while combining the functionality of a dock storage box. They are great on your boat, dock, or home deck. Choices range from high back waterside loungers to the more traditional style bench seating. Triangular dock boxes are ideal for "over the water" installation keeping the dock boxes off the dock allowing for more walkway space while still keeping the convenience of storage. Electrical triangle dock boxes are spacious options for accommodating most electrical power units. When vertical storage is necessary, upright dock boxes (lockers) are a great choice. With the same sleek design and sheen expected with traditional dock boxes, upright dock lockers offer the perfect place to store towels, swim suits, fishing gear, toiletries, or other marina equipment. Dock boxes made for trash containers allow the ultimate in performance and appearance. Trash receptacles look classy while providing a secure durable solution to keeping your dock and marina clean and free of trash and debris. Dock Boxes Unlimited®: Your Source for Fiberglass Dock Boxes Nationwide. Nothing affects the look of your docks and marina more than the dock boxes you select. The goal is to add value to your marina environment in a way that will enhance the overall boating experience, not detract from it with subpar marina equipment. When you choose our fiberglass dock boxes, you maximize the overall style and appearance of your marina. That’s why standardizing your dock boxes makes so much sense. It’s also why carefully selecting a partner to provide them is so important .You want someone with a quality selection with a reputation for strength and durability. When choosing quality dock boxes for your marina or dock, it’s more practical to choose a company that is going to be around for years to come. At Dock Boxes Unlimited® we offer the widest variety of dock boxes that complement one another. With over 20 years in the marine industry, you can depend on us for great service and longevity. With tens of thousands of dock boxes in the marketplace today, Dock Boxes Unlimited® is the leading choice for dock boxes for any size dock or marine facility. Whether you are a large marina or harbor or a small fishing camp with a few slips, the most discerning shoppers understand and appreciate the quality engineering and rugged construction we put into our dock boxes. 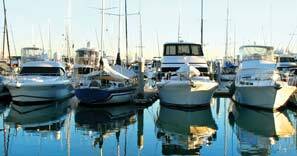 Marinas rely on our attention to detail, clean design lines, and professional clean appearance to give their marina’s the aesthetic appeal expected by their customers. Count on Dock Boxes Unlimited for class, style, uniformity, and standardization. Investing in our top quality dock boxes, you’ll have confidence in our impeccable quality. Shortcuts are not an option. 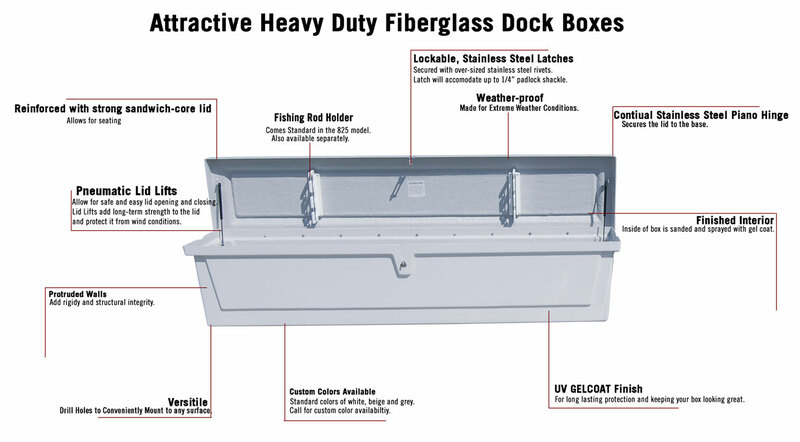 Our heavy duty white fiberglass dock boxes are built with an average 3/16” thickness with lockable stainless steel latches secured with stainless steel rivets. When you or your customers are away from the dock, trust our dock boxes to withstand Mother Nature’s harshest environments. There’s a well-told adage that you only get one chance to make a first impression. All of Dock Boxes Unlimited products offer the exceptional performance and appearance available today. We know that nothing affects the overall look of your marina more than the dock box you select. The more uniform your dock boxes are, the better your marina looks, that's why standardizing your marina with dock boxes from our fiberglass dock box collection is the leading choice with marina and harbor owners everywhere. If you want to make the right first impression, it might be time to look into using our quality fiberglass dock boxes that add to your property value, not detract.